In preparation for writing this article I came to a bit of an unsettling conclusion. I have an addiction and it may be a little out of control. I have flashlights in every vehicle I own, in every section of my home, on my rifles, pistols, and shotguns. I carry one in my pocket and a headlamp in my backpack everywhere I go. And I even (at the risk of sounding more ridiculous then I already do) wear one on a necklace. I’ve lived a lot of time outside and in many different austere environments. I know what it’s like to need a light and not have one. And the difference between a quality light, and one not up to the task. While you may not share my affinity for them, I hope that by the end of this article you will better understand what a useful tool they can be, and some good choices that may serve you well in self defense. It’s common sense to understand the usefulness of a flashlight. Anyone who’s tried to find the keys they dropped under their front seat knows. Beyond this however, most people don’t give them any thought. Flashlights are seen as more a comfort item then a potential lifesaving tool. In an emergency, a flashlight can mean the difference between life and death. And few emergencies are as urgent as a self-defense encounter. These days it’s perfectly normal to see someone pull out a smart phone to use as a flashlight. I’ve nothing against it and have done it many times myself. But in an emergency, you might want to save your phones battery to call for help. If you have a gun for self-defense and need to be on the phone with police while you have a bad guy proned out in front of you, a cell phone is not going to cut it as a light source (among many other issues). The chance of this happening to you is something everyone needs to decide for themselves. Personally, I have needed a flashlight to extricate myself from some sort of predicament many times. Those experiences have led me to believe the cost of carrying a light every day to be worth it. If you own a gun for self-defense however, I believe you should have some sort of light source nearby if not on your body. While it may be your right to own and carry a gun for self-defense, it is your duty to do so in as responsible a way as possible. The four firearm safety rules do not go out the window because a burglar is in your home. Without light to see, how will you know your target and what is beyond? And how will you know if you are pointing your gun at someone you are not willing to destroy, like a spouse, as this man did in Colorado? Such a simple thing like a quality flashlight could have prevented this accident/negligence, and makes it clear the importance to an armed defender. The lights reviewed in this article are only weapon mounted. I do not go into stand alone EDC Flashlights. There is, of course pros and cons to each method of carrying a light. If this is something you are interested in learning about, please read this article by Jacob Paulsen, Hand Held Vs. Weapon Mounted Lights. Reliability should not be an issue with any of these weapon mounted lights. All companies represented here have good reputations within the firearm community. First, a disclaimer before I get into the details: There are many, many types of lights on the market. Varying in a wide range of sizes, prices, and features. 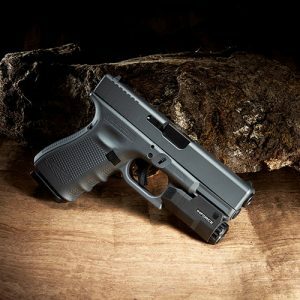 This article is to represent some of the most popular choices for use on a CCW pistol. These lights are of a size that will be easily carried concealed. 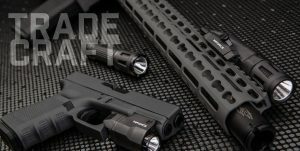 Other lights, such as the Surefire X-300 are great, with lots of lumens, but are generally too bulky to carry concealed comfortably because the light extends well beyond the muzzle. 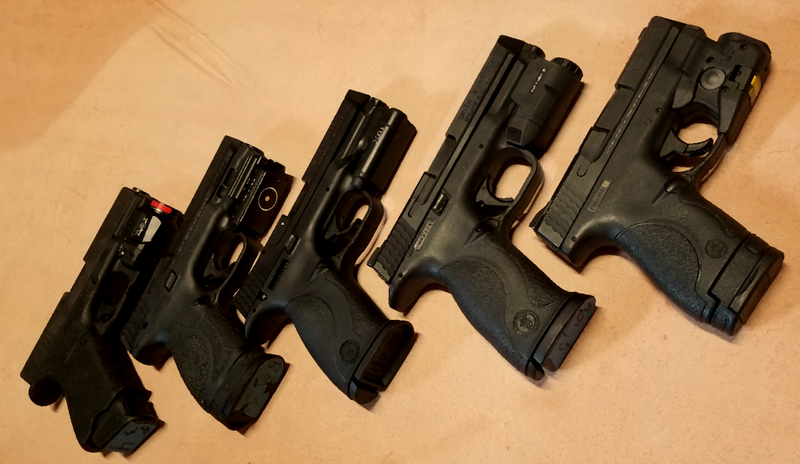 The X-300 and other similarly sized lights might be a better choice for a home-defense pistol since you are not going to be concealing the pistol on your body. Surefire X-300. 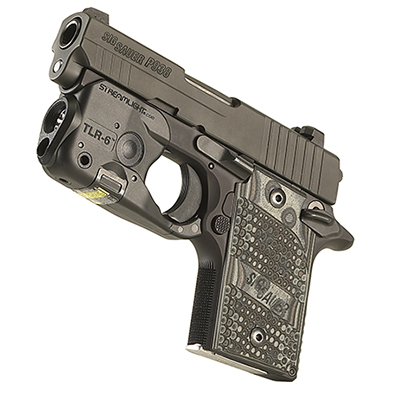 The bezel of the light extends past the muzzle of the pistol making it more difficult to carry concealed. As with most things, any light will have trade offs. Smaller lights will generally have shorter run times, and lower lumen output. There is no such thing as “the perfect light,” but every item on this list balances these compromises well. The primary reason to choose a light from this list is the size of the light. Each light listed below ends at the muzzle of the pistol. This reduces the overall size of the pistol and makes carrying more comfortable. Carrying a gun every day does not come without its discomforts. But one of these lights below will effectively reduce the impact of a “full size battle light” and help encourage you to actually carry your defensive weapon. 500 lumens is plenty of light for such a small package and great to have when you need it. Reasonable price point if above average. Streamlight has built itself a reputation of quality over the years and I have never regretted my purchase of their products. The ambidextrous switches are positioned a little farther away then I would like. I am a larger sized guy with largish hands and I have minor difficulty reaching them with a full firing grip. I found I had to disengage my right hand slightly from the grip of the pistol to reach the switch with my trigger finger. This in no way means the TLR-7 is unusable, it just bothers me a little and it might bother you too. CR 123A batteries have become a sort of industry norm for tactical lights. They are expensive and can be a pain to find in stores. *The TLR-8 is essentially the same light, but with the addition of a laser. 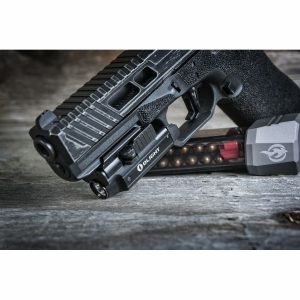 Streamlight has answered the call of the market to provide a quality weapon light for pistols without an accessory rail. 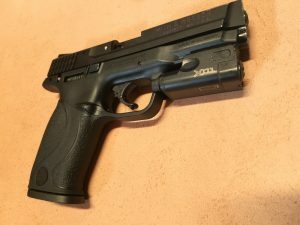 The light attaches in a near seamless fit around the front of the trigger guard for a surprisingly stable connection. There are very few other companies offering lights for pistols without rails, and fewer still if any, who do it was well as Streamlight. The addition of the laser is something that might increase accuracy in low-light environments, providing the home defender understands the limitations, and the laser is not used as a substitute for good shooting fundamentals. Don’t let it become a crutch to perpetuate poor shooting skills. The CR-1/3N Lithium batteries used in this light/laser combo are more difficult to find then the other batteries on this list and might be a deterrent for someone looking for the least amount of hassle possible. Replacing the batteries however is quick with the easily accessible trap door at the bottom helping to lessen this issue. 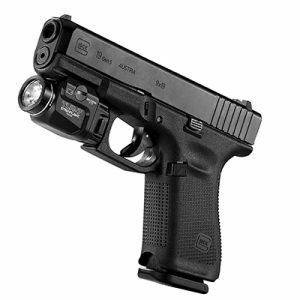 This light has the lowest amount of lumens out of the other lights on this list, but it is certainly better then nothing, and the only option available if you carry a subcompact pistol without an accessory rail. The ease of taking the light on and off is very low. It takes more time and is slightly more complicated then other lights. The armed citizen who chooses this light will probably want to leave it attached permanently. The APLc has the best activation button out of all the lights listed here and is a big plus in my opinion. In a defensive encounter I don’t want to be fumbling about looking for the switch. Good training could fix this problem, but the large size of the ambidextrous switches makes for intuitive activation and can be reached without disengaging the firing grip. The battery, (CR2 ) deviates from the industry standard of CR 123. This can be a detractor if you already have a good stock pile of CR 123’s for other lights. More difficult to find, and of course more expensive to replace. 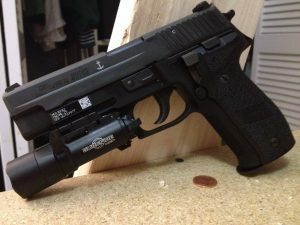 200 lumens is a little on the low side for a compact pistol light compared to other lights in this article, but should serve well in the capacity of a CCW light. The rechargeable battery means never having to purchase batteries again. Additionally, the ease of charging with the included magnetic USB makes it easy to keep your battery topped off for when you need it. 400 lumens is impressive, especially for a light with as many features at the Olight PL-Mini. The price point of only $80 is exceptional and the lowest cost light on this list. The throw lever on the side of the light makes it the easiest on this list to take on and off. I much prefer the paddle style switch of the Inforce APLc over the more cumbersome switch of the PL-Mini. Another potential concern to consider is ensuring you don’t lose the charger for the light. Replacement or back up chargers are available from the Olight website. AAA batteries are everywhere and easy to find. You could even probably steal one out of electronics around the house if needed. Surefire’s reputation for quality may act to tip you over the edge when considering purchasing this light. Surefire is trusted by many professionals all over the world. The battery life of an XC-1B is the shortest on this list by 15 minutes. However, the included rechargeable AAA battery does help reduce the impact slightly. *Although, the 45-minute run time and 300 lumen output might be reduced depending on the battery you use. According to the Surefire website: “All performance claims tested to ANSI/NEMA FL1-2009 Standard. Runtime and output will be reduced when using a lithium or alkaline battery.” I assigned a lower score for lumen output because of this. The cost of the XC-1B is the biggest detractor of this light. Retailing at $85 over that of every other light on this list. As many gun owners know, Surefire products are rarely inexpensive. Now for the tally. These scores are based on my opinion and experience with these lights. Keep in mind your opinion might conflict with mine, so make the right choice for yourself. Whichever you choose, any light from this list should serve you well. The Olight PL-Mini Valkyrie is far and away the best light in my opinion. The cost of the light, lumen output, and the fact that it can be easily recharged is hard to beat with the other lights. Having not been around as long as the others, the PL-Mini doesn’t have the same track record of reliability, but in my experience, Olight makes quality, well thought out products. You need to learn how to use it. Lights are tools and like any tool, you must understand how to utilize it in a way that will make it an asset and not a liability. While playing the role of OPFOR (Opposing Forces) for the International School of Tactical Medicine in Palms Springs CA, I saw first hand how useful, or detrimental, light can be in a gunfight. I was given a Simmunition pistol and told to hide “somewhere” inside an abandoned mall. The SWAT and Special Operations students in the class then tried to locate and neutralize the threat (me). Being “the bad guy”, I was able to observe first hand proper use of light, as each team exhibited varying degrees of proficiency. Those students with a good understanding of light discipline were significantly harder to ambush and fight than those who did not. Those who did not understand how to use light correctly, however, were easy targets. Click here for a Complete Home Defense Course, which includes sections on the correct use of light. Lights can either be a fantastic asset, or a terrible liability. Training for proper use of light in a defensive encounter is very important and should be high on the list of training priorities for the armed defender. Lights are critical in a low light situation. I always have a light on me in the evening, and we keep both a shotgun and a G21 with lights on them next to the bed at night along with several hand held lights. It’s your responsibility no matter what to be safe. CR123A and CR2 batteries are generally readily available in the electronics section in many major stores(Walmart) or can be purchased online and shipped to your home. My opinion is that the battery shouldn’t be a concern unless it affects performance. Great article. I just bought a light for my weapon I carry concealed. I’ve been researching them to find one that best fits me. So sad to hear another Officer lost his life. About a year ago our motion censor went off and it tripped our alarm. The company called asking if they should send the police. I told them yes because we were about 7 miles from our house. Usually the police get here within a couple mins but I got here before him. The one time I wasn’t carrying and this happens. I unlocked the door and the cop told me to stand back. I thought it was odd that he didn’t announce himself before walking into the house. Nor did he announce himself at any point. Thank God no one was in the house and he was safe. I was more concerned about something happening to him due to not announcing himself than someone being in the house. Strange! Still don’t know why the motion censor went off.